All transactions are safe and secure with a reliable history in online purchasing behind each of our associates. 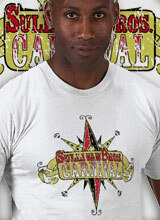 Buy the Sullivan Bros. Carnival t-shirts to own Heroes clothing and merchandise. This unique piece of Heroes merchandise features the logo for the Sullivan Bros. Carnival. The traveling carnival offers sanctuary for those individuals gifted with extraordinary abilities. This Heroes tee lets everyone know that you are one of the gifted ones. Hiro teleports fourteen years into the past to the Sullivan Bros. Carnival on the NBC Heroes TV show and ends up fixing Ando's relationship with Kimiko. If you're feeling like an outcast, perhaps you can join the Sullivan Brothers Carnival. You can work as a carnie and be surrounded by friends. In addition to the Sullivan Bros. Carnival tees above, browse the Heroes Clothing Gallery for more apparel like men's and women's clothes, kids shirts or hoodies.